The 2018 NFL Draft is in the bag, leaving the teams, players and even fans wondering how great will this year’s class be? The answer to that question may take years to be answered, as this year’s draft class was filled with talent through the first five rounds that could stand out as soon as this season, while the sleeper rounds (6th & 7th) have the potential to produce a few solid studs as well. That said, we do like this class as rookie mini camps get set to start including the decision for teams like the Browns and Ravens to address their needs at quarterback while a sudden fall of possibly the best wide receiver to Atlanta looks like a potential to be the steal of the 2018 NFL Draft. Here a quick look at some of the key draft picks from the 2018 NFL Draft that have the talent to be big time players at the NFL level. Derwin James, Los Angeles Chargers: While all the talk was about the quarterbacks in this year’s draft class, a stud safety went nearly unnoticed as he saw his name fall to the 17th pick overall. The former Florida State Seminoles safety has all the tools, physical skill sets and football IQ to be the best player in this year’s draft. Sony Michel, New England Patriots: Michel wasn’t one of the first running backs drafted in this year’s draft class but the versatile back, out of Georgia, has the tool set to be a three down running back while being a true threat out of the back field. The only concern heading into the season has been injury issues that Michel has dealt with over the course of his college career. Other 1st round selections to monitor: D.J. Moore, Calvin Ridley & Terrell Edmunds. 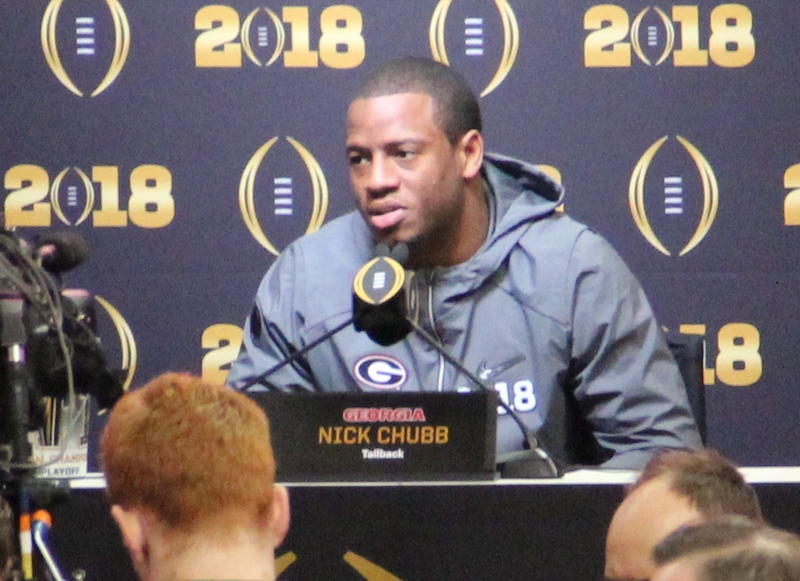 Nick Chubb, Cleveland Browns: After an impressive first couple of picks, the Browns didn’t disappoint their fan base in the second round, adding Chubb to their back field. Despite being projected as a mid 1st round pick, the former Georgia Bulldogs running back fell to the second overall pick in the 2nd round. Kemoko Turay, Indianapolis Colts: As the NFL continues to turn to the pass, the need to get to the quarterback on the defensive side of the ball continues to rise. The addition of Turay to the Colts defense should help the club put up some solid numbers on defense while shutting down opposing offenses. Other 2nd round selections to monitor: Dallas Goedert, Josh Jackson & D.J. Chark. Tre’Quan Smith, New Orleans Saints: Much like Ridley in the first round, Smith should benefit from being drafted by one of the best passing teams in the NFL. Look for Smith to shine at various slots on the field, as Drew Brees looks to find his next favorite weapon. Smith brings solid size and an ability to go get the football. Other 3rd round selections to monitor: Orlando Brown, Justin Reid & Michael Gallup. J’Mon Moore, Green Bay Packers: Here is another receiver that found a way to a top tier passing offense. While the team added talent during the offseason for Aaron Rodgers to throw to, the addition of Moore gives the team another threat. Moore’s big frame of six foot three inches should allow him a chance to make big plays. Other 4th round selections to monitor: Dorance Armstrong Jr, Kyle Lauletta & DaeSean Hamilton. Maurice Hurst, Oakland Raiders: The fifth round may end up over time as one of the better later rounds in NFL history depending on how each player plays over the next few seasons. One of those names that could make this fifth round special is Hurst who was drafted by the Raiders. The former Michigan Wolverine should unleash a ton of havoc on opponents while being a disruptive defense across the field. Other 5th round selections to monitor: Shaquem Griffin, Micah Kiser & Siran Neal. Equanimeous St. Brown, Green Bay Packers: Yes, you read that correctly, two Packers wide receivers have landed on this list. Brown who is the taller of the two receivers has had issues with his ability to hold onto the ball while lacking the physicality that an NFL receiver needs to possess to be a productive wide receiver. If Brown can work hard, he could prove critics wrong. Other 6th round selections to monitor: Bradley Bozeman, Jordan Thomas & Sebastian Joseph. Andre Smith, Carolina Panthers: Could the mentoring of Luke Kuechly develop this 2018 NFL rookie into a solid deep fantasy sleeper this season? Smith, who may have fallen due to an injury that knocked him out of the season, has the speed, size and arms to make opposing quarterbacks worry about him. Look for Smith to be a stud as a 7th round draft pick. Other 7th round selections to monitor: Kendrick Norton, Bo Scarbrough & Leon Jacobs.